The first fact to keep in mind is that the SEC is not getting rid of the XBRL requirement. XBRL is a real and permanent part of the SEC reporting process. This WSJ article makes clear that to this point, all the effort, expense, and time that has gone into creating XBRL filings since 2009 has amounted to little more than an exercise in simple SEC compliance, and that the ostensible end-users of XBRL data—investors and analysts—have found little of value in the vast quantities of code. XBRL is a reality, and it will continue to take a considerable amount of time and some expense. So instead of muddling along merely complying with this SEC mandate, there is an opportunity for SEC Filers to add some actual value to their XBRL filings. Companies can choose to have their XBRL documents created by true professionals. XBRL experts can create documents that go way beyond merely satisfying the SEC’s mandates. If the data is well-built, XBRL actually has the potential to be a value-added expense for companies. As you can see in this article, investors want to be able to use XBRL, and companies that have well-built XBRL are more likely to get favorable attention from investors. 1) Our XBRL code is built by CPAs that are XBRL experts. XBRL creation is their primary focus and core competency. Our XBRL documents are not simply compliant, as we take pains to make the data very clean and as usable to the analysts and investors as possible. Because the data we create is so well-built, using RDG for XBRL actually has the potential to be a value-added expense for companies. 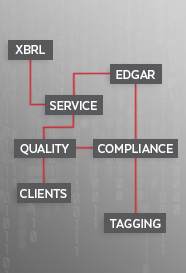 2) RDG Filings offers comprehensive XBRL Quality Assurance Solutions that we believe will be of vital importance. Not only as the limited liability exemption runs out, but also as XBRL become more widely used by investors and analysts, companies doing XBRL in-house or with most any other provider are going to need a very in-depth auditing process that will ensure the accuracy, completeness, and usability of their data for the investors who are the ultimate targets. XBRL is here to stay; it needs only to be better built. The article references an SEC filing company that has been paying nearly $100,000 per year for XBRL tagging and filing. That amount of cost is absolutely unnecessary. RDG Filings will add value to your XBRL filings, while diminishing your costs. 2) Highly valuable to the investors and analysts it is designed to help. 3) A more streamlined aspect of your filing process. 4) Much more reasonable priced.